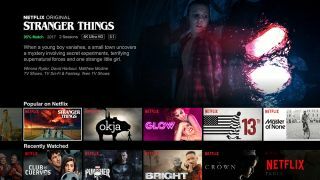 Netflix considering interactive films and TV shows | What Hi-Fi? The Butterfly Effect, Blade Runner and I Am Legend: films with alternate endings that are better than their director’s (or studio’s) chosen one. Confident you would pick the right one? Netflix could soon give you a stab at the director’s chair. The streaming service is considering launching content that lets viewers choose how a show will end. People who are supposedly ‘familiar with the matter’ have told Bloomberg that it is working on specials that will let subscribers choose between a list of storylines in a TV episode or film. And rumour has it that one interactive episode will be part of Black Mirror’s upcoming (fifth) season, which is due for release in December. Interactive entertainment seems to be a very ‘now’ concept, with the smart speaker platform also venturing down the audience participation path to entice and engage users. The new series would be Netflix’s first foray into choose-your-own-adventure film and TV shows for adult viewers, although it already uses that model for interactive kids animation programmes. The first shows with this feature were Puss In Book: Trapped In An Epic Tale and Buddy Thunderstruck: The Maybe Pile, while a third show, Stretch Armstrong: The Breakout, is due to land on Netflix next year.